Ami Simms, founder of the Alzheimer's Art Quilt Initiative (AAQI) has added a new feature to the AAQI line-up of Quilts For Sale. Called Sales on the Road, it is an experimental project in which all of the quilts that you see on this page will be offered for sale at the May 22 meeting of the River Country Quilters Guild. If this additional sales idea proves successful, AAQI will invite other individuals or groups to take limited numbers of quilts for sale at other specific times and places. Please do note, that these quilts are not meant to be purchased online as they are being set aside for this special sale. But do take a look at all of them, and if you are a member of the River Country Quilters Guild...... or come in as a new visitor or guest....I truly hope you will consider a purchase of one of these great little quilts....see all of them on this AAQI Sales on the Road page ....but especially of these two quilts from my own Liberated Quilting Challenge!!! I love BOTH of our quilts and while they are SO very different, they still have SO VERY MUCH IN COMMON! 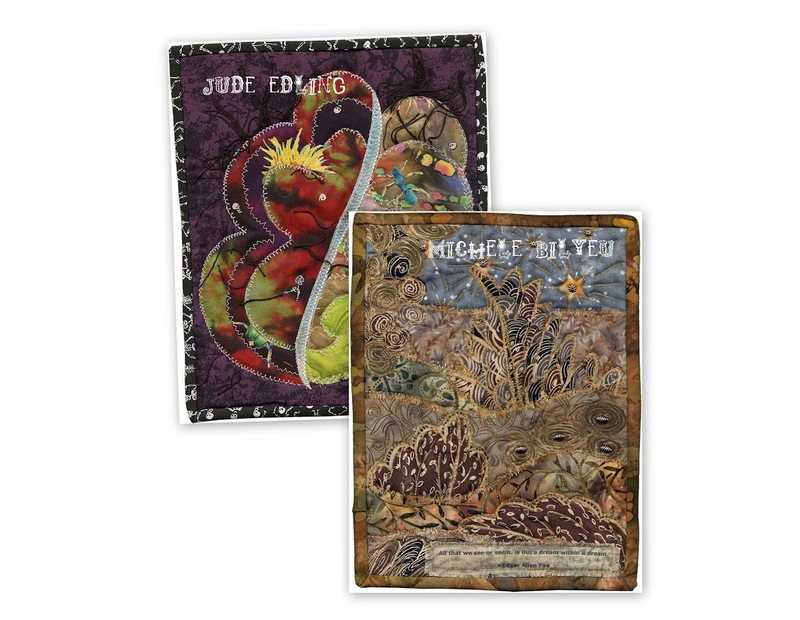 They would be fabulous displayed on your own art quilt wall at home! So, please consider purchasing BOTH Jude and my quilts :) What an awesome contribution this duo would make towards funding Alzheimer's research! Remember, the profits from the sale of all AAQI quilts go to fund our cause. When I think about it, isn't that pretty much how we feel on the days when our own minds are frazzled and disconnected? We are in such a crazy place where not only our mental abilities collide.... but so do our abilities to tell what is real, and what isn't. But what about the person with Alzheimer's Disease? Alzheimer's Disease is very, very real. It's victims live in a shattered world of illusions, and altered realities. Memories become either hazy and dreamlike..often even beautiful or places we have never been, things we never really did... or overly exaggerated and anything but beautiful... with hallucinations and false memories of things that may, or may not, have even happened. Both of these quilts will be for sale at the May 22 meeting of the River Country Quilters Guild. Please buy both of our quilts and help us make a difference in the reality of the 5.4 million victims of Alzheimer's Disease by continued Alzheimer's research funding!!! Materials/Techniques: Batik, novelty fabric, fusible and glow in the dark thread. Artist Statement: This is the third in my Brain series. It glows in the dark. Materials/Techniques: Designer cottons and batiks with applique, ink jet printing, Shiva oil sticks, metallic threads in free motion quilting, and golden beads. Artist Statement: Edgar Allen Poe once wrote, "All that we see or seem, is but a dream within a dream." I wanted to create a deep, but still magical little quilt that brought the viewer into that dream...but allowed them to still see the golden nuggets of hope within. Dedication: For my mother, who married my father 62 years ago, to share his life, his dreams, and his search for a golden future together. Alzheimer's might have changed those dreams, but it didn't completely destroy them. She dreams of him, and loves him, still. I love both of these. Your right...I can see how they are different sides of the same brain! How fun! I hope they both sell and the quilters buy lots of the others too! These are both awesome. Good luck for the special sales and I hope all of the quilts sell. I am so impressed by your blog, your work, and all that you do. Thank you and I am so glad I discovered this site. I think it is a wonderful idea! And my quilt is one of those that absolutely has to be seen to be appreciated. All of the gold quilting thread reflected back from the scanning, plus the browns are muted and subtle. But in real life, it swirls and pulls you in..my goal ;) Sure do hope they sell, lots more sell, and the experiment is a huge success! Okay,Michelle, you "slivery" woman, I want to see that sliver block! Sounds interesting.